My second Ironman is in the books! It was the best of days and it was the worst of days. After all of my positive training this summer I picked the wrong day to have a mental low and I just couldn’t pull myself out of it. At the end of the day though it is very hard to be pissed off about finishing an Ironman because the finish line of an Ironman is never a guarantee. If anything the pull of an Ironman will be there again because of the challenge to try and put together a better race. I realized something out on the bike course yesterday. The majority of us will never be a professional athlete or will never go to the Olympics. 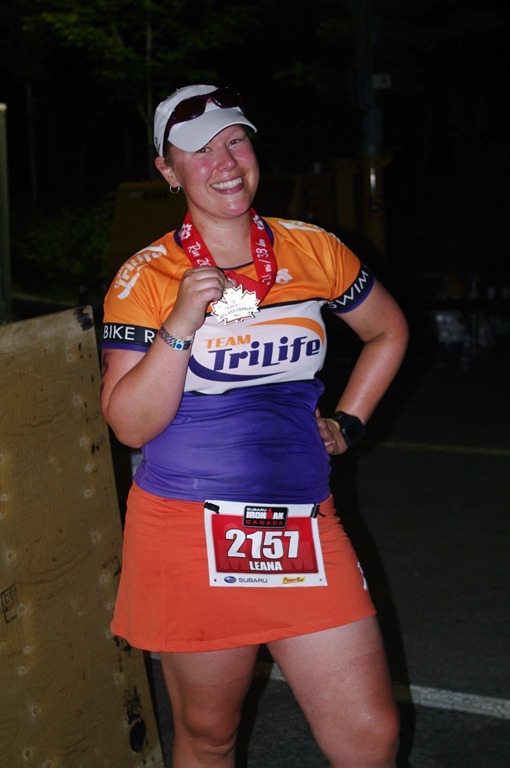 Ironman is one of the times when you may feel that close…where complete strangers are cheering you on like a rock star, sitting in their driveway as you pass by at 11 pm just to tell you how proud they are of you. People that you have never met before who want nothing more for you to succeed and be the very best you can that day. The fellow racers you’ll meet who may help to pull you to the finish line. Finishing so late in the day is an interesting place to be. Despite the stress of trying to make it in before the midnight cut-off the camaraderie out there was amazing. When I slowed down I had people I’d just met call out and say, “Come on Leana, we can make it.” Thank you to all of you…Linda from Cochrane, Pam and Rachel from the VO2Multisport team in Seattle, James from San Francisco. You were amazing last night and I hope you loved the journey to the finish line. As I said on twitter and Facebook last night, the highs and the lows of the day mean nothing when you are running down the blue carpet toward the finish line. What an amazing feeling. Thank you to my husband, family, amazing teammates, my virtual and real friends on twitter and the complete strangers who helped me get there. Congrats on IM No. 2 Leana! Can’t wait to hear the long version of the story! Congrats Leana you are an IRONMAN x2! I agree with other comments, pulling through an ironman on a day that isn’t your best says A LOT! Congrats again and I’m looking forward to the long version of the story. You are right. Finishing an Ironman is no guarantee and something to be so proud of. And you have done it twice! I love cheering on the people near the end even more than the early finishers. I love the second paragraph you wrote in this. Yay for you! Congratulations! What a tremendous accomplishment. I came across your blog when researching sports bras to wear during a tri. Great experiment! Excellent job on your IM finish. HOLLA!! Way to be! 😀 Congrats! Congratulations! Can’t wait to read the long story.